Update: Rehearsals are underway for tonight’s memorial concert at the Liberal Jewish Synagogue, London. Some tickets are still available to buy on the door – cash only. The concert will take place in the beautiful sanctuary of the Liberal Jewish Synagogue, London, on 22 November 2018. The evening will begin with a drinks reception at 7pm. The official programme will begin at 7.30pm, introduced by special guest Dame Esther Rantzen. The concert will begin with a candle-lighting by Kinder. The music will consist of an exclusive, one-off performance by two acclaimed German musicians who have come specially for this occasion: cellist Friederike Fechner, and composer, conductor and pianist Mathias Husmann. Double Olivier ‘Best Actor’ Award winner Roger Allam and RSC star Mariah Gale are also going to perform readings. The musical performance promises to be particularly poignant: Friederike Fechner recently helped to unite descendants of the Blach family, originally of Stralsund, through her research. Multiple branches of the Blach family were torn apart by Nazi persecution, and many members of the family did not survive the Holocaust. Two of the children survived by coming to Britain on the Kindertransport. Another descendant, AJR trustee Gaby Glassman, is co-organising this special evening. All proceeds from ticket sales, with the exception of a small booking fee, will go directly towards The Wiener Library’s work to collect, preserve and share evidence of the Holocaust. The Library depends on donations for support and we would welcome any additional support. To give a gift to the Library over and above the ticket price please contact us at development@wienerlibrary.co.uk or call 0207 636 7247. This event has been organised with the kind support of the Liberal Jewish Synagogue, London. 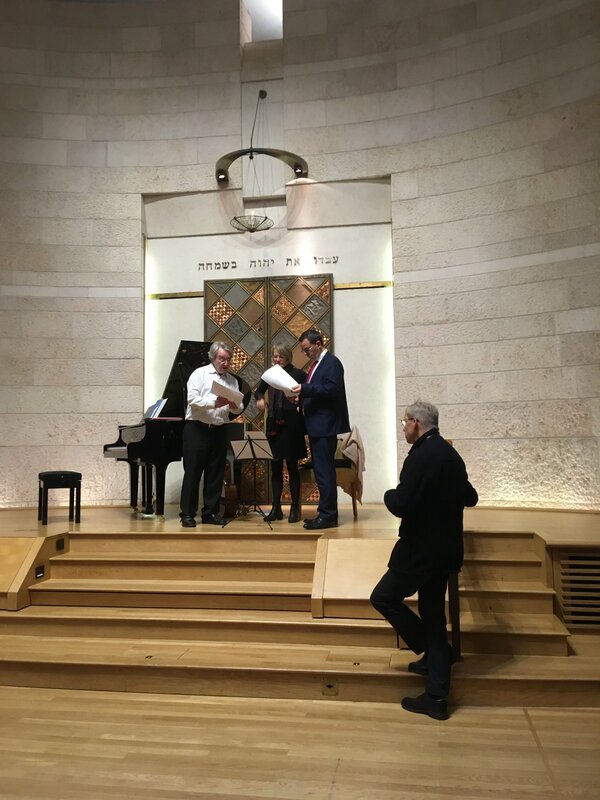 We are grateful to the musicians for performing pro bono and to the Liberal Jewish Synagogue for donating the use of its hall. The programme will include compositions by Maurice Ravel, Felix Mendelssohn, Max Bruch and Ernest Bloch alongside select readings. The full programme will be announced closer to the date of the event. For further information, please see ‘Further Information for Guests’, below. You will receive a printable e-ticket via email when you book for the concert. For security reasons each guest must have their full name on their e-ticketmatching the name on their photo ID. Please double check that your full name, and the full name of any guests booked by you, appears correctly on your e- tickets. You will need to either print out and bring your e-ticket or, alternatively, show your e-ticket on a mobile device when you arrive at the synagogue. In both cases, you must bring photo ID on the night and ensure that the name on your e-ticket must match your photo ID. Doors will open for the concert at 6.45pm. The drinks reception and the Sanctuary (where the concert will take place) open at 7pm. The official programme of the concert will begin at 7.30pm, so everyone will need to have taken their seats by then. Seating is unallocated for the concert with the exception of a reserved area at the very front for Kinder, accompanying family, performers and official guests of the Library, so you may wish to arrive and take your seats promptly. All seats will have a good view of the stage. The nearest bus stop is a 5-7 minute walk from the synagogue. Buses run frequently and include routes 13, 82, 46, 113, 139, 187, 189 and 274. The nearest underground stations are St John’s Wood (Jubilee Line),a 12-15 minute walk from The LJS, and Baker Street (Jubilee, Central, Metropolitan, Bakerloo), a 15-20 minute walk. There is limited parking on St John’s Wood Road and the adjoining side roads, with pay-by-phone parking bay restrictions ending at 6.30pm. There is a car park situated a 10 minute walk from the synagogue on Lanark Road, W9 1UB.